My phone rang at 5:09 PM last Thursday. It was a call that I had anxiously been waiting and praying for, however in that moment, I wasn’t expecting it. I was too excited and deep in thought, regarding all that had taken place earlier in the day. Pastor Luis, Nieves, Sergio and myself had the opportunity to spend the day up in a little pueblo called Naguachi (3 hour trek into the mountains), ministering alongside our friend Aaron Wiens. The Lord has called Aaron up there to pastor a little church and its been amazing seeing what God is doing thus far. Deep in thought and excited about what I had just experience, my phone rang. “Bueno” I said (which is the typical way to answer the phone here). 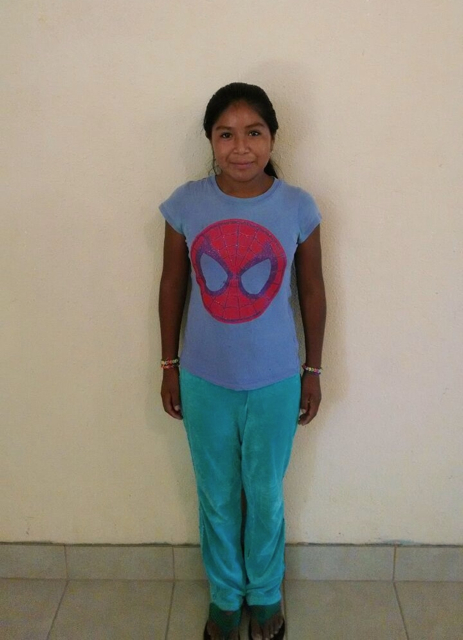 At first I thought it was our accountant, Arcelia, but it was actually Maricelia, the DIF worker from the town Guerrero (about 1 1/2 hours away). I quickly passed the phone to my Tio, as I wasn’t understanding what she was sharing. After about a 10 minute phone call, Luis hung up the phone with a big smile on his face. He let us know that our second child (or resident, as they refer to down here) would be joining our children’s home tomorrow! Many of you have been praying with us, for a little 10 year old boy named Luis. The DIF has been wanting to bring him to our home for a few weeks now. They felt that with our home being new, and the amount of care-takers we have, Casa de Bendicion would be a good fit for Luis…and give him the chance he deserves. Friday was a very exciting, yet emotional day, as our team worked extra hard to prepare to receive Luis. A thousand thoughts raced through my mind…a mixture of both excitement and sadness. I wasn’t sad that they were bringing him here, but because of the things this little boy has endured, in his 10 year life span. The DIF in Chihuahua had given us a little bit of information about Luis, but we were able to receive the complete story, when Eddie and Anna (DIF employees) arrived with Luis. Their truck pulled into the home around 6:30 PM. There in the back seat sat Luis, who had an immediate smile on his face when he saw us. After meeting everyone, we came into my office and met for about two hours. Pastor Luis, Nieves and myself had a wonderful time, with Eddie and Anna, as they shared the story of Luis, as well as answered all our questions. We had initially been told that Luis had witnessed his parents being killed. However, it doesn’t seem like that is the case. 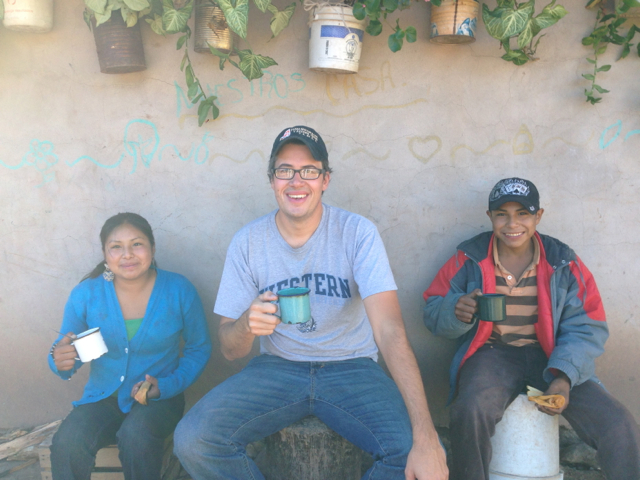 Luis’ father, is an alcoholic, which led Luis to flee his home often and roam the streets. A nearby store clerk, would give Luis chips and cookies, when he would see him. The police would find Luis in random places and bring him back home to his drunk father. No one knows what happened to or where his mother is. One of the evenings, the police brought Luis back to an empty house. His father was gone, and has never been seen since. There is no record of any other family, aunts, uncles, grandparents, etc..in Luis’ life. Truly he is an orphan! Since then, Luis has been in 5 different children’s homes. Most of the time, not lasting more then a few days or weeks there. The main reason, homes would send Luis back to the DIF, was because they said he was “to difficult to handle and doesn’t obey.” Most of those homes had an abundance of children, few care-takers, and so that led to Luis being neglected once again. 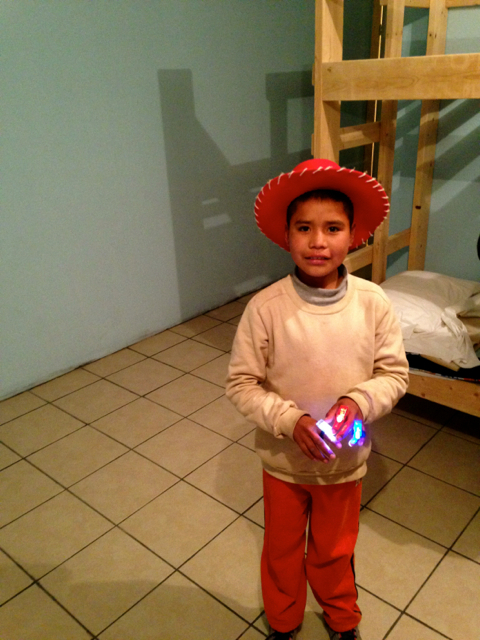 In one of the homes, Luis attend school for about a month and a half. He was doing well in school, but the care-takers decided they didn’t want to take him to school anymore. So, as a result of neglect, no schooling, lack of attention, and Lord only knows what kind of sexual and physical abuse, Luis has the mindset of about a 5 year old. They have run numerous tests on him, to figure out “what he has.” In fact, earlier Friday morning Luis was at the neurologists’ office, receiving more tests. All tests have come back negative, and our conclusion is, is that Luis needs a lot of LOVE, ATTENTION, and JESUS! After our meeting with Eddie and Anna, we gave them a tour of the home. Ayantu immediately showed Luis where her toys were and Luis quickly attached to Antu’s rocking horse and red cowboy hat. 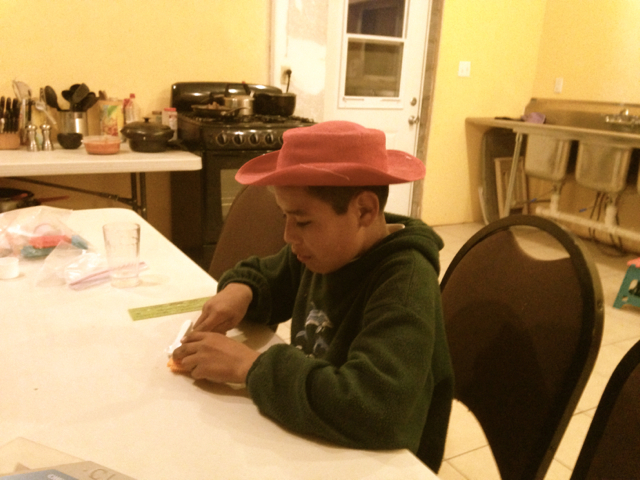 In fact, aside from sleeping and when we pray for meals, Luis hasn’t taken the hat off. He sleep all though the night, Friday, and was eager to wake everyone up at 6 AM Saturday morning. He has a beautiful smile and contagious laugh. It seems like already, he is adjusting well to being here. There are definitely some boundary issues that we will need to focus a lot of attention on, but overall, we’ve all fallen in love with the "little boy in the red hat". Luis has been with us for almost a week, and is doing tremendously well. He is learning and adjusting to our rules and what he can and can’t do. He is full of smiles and laughter all day long. He loves music, dancing, singing, riding the scooter outside, playing with the dogs and giving out lots of hugs. Everyday, he makes his bed without being told and is a big help with the chores and dishes. 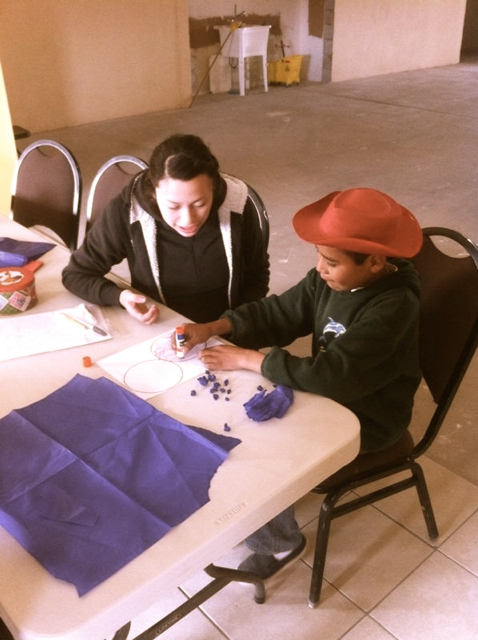 We have a tutor that comes and works with Luis for 2-3 hours a day. 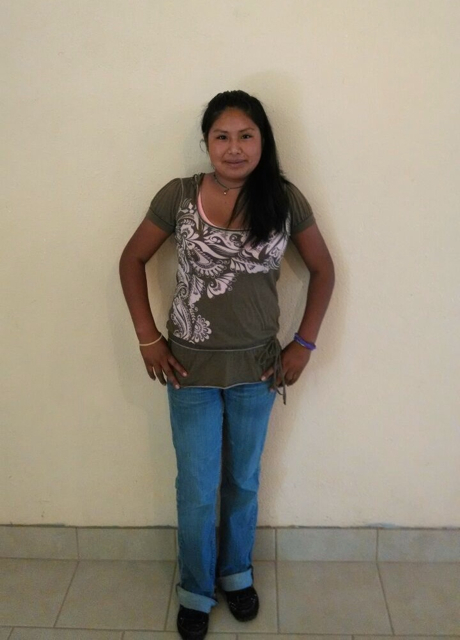 Karen (Nieves’ wife) took classes in college, learning how to deal with children with special needs. Luis is responding very well with Karen and she is doing an excellent job with him. I love having this little guy with us. Its such a joy to pray over him at night, give him hugs, share the love of Jesus and give Luis the attention he so badly needs. I'm confident and know that our God is bigger then any disability or special "needs" Luis may have. Both in the United States and Mexico, we constantly are trying to put a label on peoples “problems”…they have ADD, this disorder, that dysfunction, one more deficiency and whatever other “D” words there are out there. Please understand me, I’m not down playing some of those medical issues, nor the seriousness of them. But saints, JESUS IS ALIVE…He is the Divine Physician. His entire ministry was focused on healing and delivering people, both physically and more importantly, spiritually. And guess what, He still desires that and is doing that this very day. The Lord wants nothing more then for little Luis, to commit his heart and life to Him, no matter what problems he may have. The Lord loves Luis so much...in fact…as our Lord hung on the cross, He was mindful of the "little boy in the red hat." "And He said; behold, I make a covenant. Before all your people I will do marvels such as have not been done in all the earth, nor in any nation; and all the people among whom you are shall see the work of the Lord. For it is an awesome thing that I will do with you" (Exodus 34:10).